ARRI Alexa XT cameras will be delivered with the Internal Filter Module (IFM) filter holder installed — except the Alexa Studio which has its own motorized ND filter system and cannot use of the Internal Filter Module. The filters that go into the IFM are called FSNDs. They are not included with the Alexa XT cameras, and have to be purchased separately. • Internal ND filters are smaller and lighter. • They can avoid reflections you can get with multiple filters in the mattebox. • Internal ND filters can reduce flares and narcissism (double image from reflections between the rear element of the lens and the sensor). An ND filter between the rear element and the sensor can reduce these reflections. • An internal ND (or clear filter) protects the sensor from dirt contamination during lens changes. The new filters used for the IFM are not the same as current external ND filters. • An anti-reflective multi-coating, which is absent in most external filters, maintains high image contrast. • Water white optical glass is precision polished. • A broadband absorptive coating ensures an even attenuation of the light over the full spectrum, which is why they are called Full Spectrum Neutral Density (FSND) filters. There is no color shift at any density. 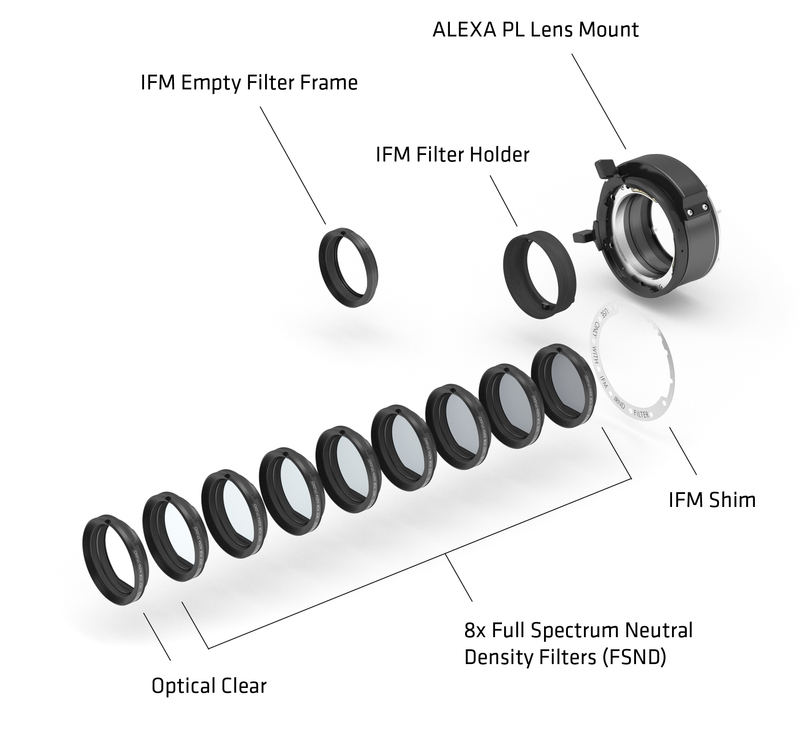 The Alexa XT Internal Filter Module is compatible with all ARRI 35 format lenses. ARRI has yet to find a lens from any manufacturer that it is not compatible. However, you never know — so the filter sets include a depth gauge to make sure a lens fits. 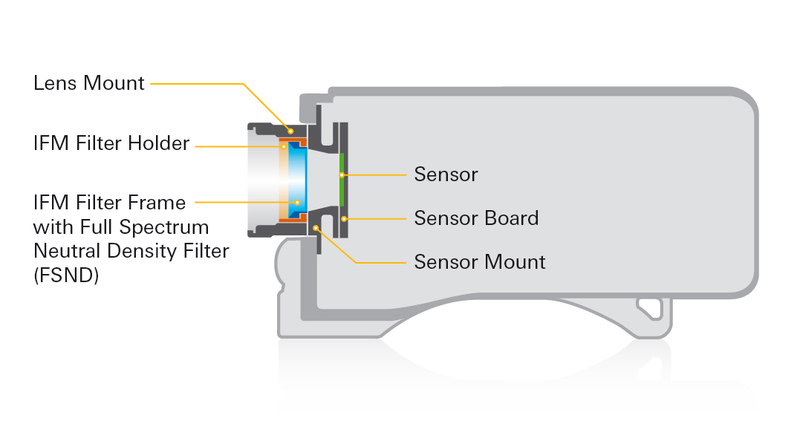 The FSND filters are relatively far away from the sensor, so if there are small specs of dirt on the filter, they will not show up in the image at most common T-stops. When using FSND filters, be sure the rental house has installed the IFM shim in Alexa’s PL mount. Using any filter between the lens and the sensor increases the flange focal distance by 1/3 the thickness of the glass, and this shim accounts for that. Once the shim is installed, you will always need some kind of filter between lens and sensor: either an FSND or an optical clear filter, which ARRI also provides. No color shift in the Alexa with these filters all the way up to ND2.4, amazing! Any plans on selling this glass as stand alone external filters? The Schneider Platinum IRs take forever to make. Months of back orders. There could be two $ale$ $tream$ here for Arri. Hint Hint. We thought about making these filters also as external filters, but the trend is towards in-camera filters, and we are not so sure if we can make these filters any bigger. So for now we will not offer them as external filters. What is exactly the IR characteristics of these filters?. The Alexa has its own IR filter cutting at 700nm, but what about Far Red contamination?. Do they act like the Tiffen IRND´s or the Schneider Platinum? I was curious if anyone has tried to put diffusion or other effects filters in this internal filter system? I was considering an Ultra Contrast 1/8. Perhaps even heavier. Can one get custom filter ring inserts manufactured? 1. When using the ARRI FSND filters, you need to use the FSND shim (the one labeled ‘USE ONLY WITH IFM FSND FILTERS’) under the lens mount. The shim comes with the kit. This is the same shim for all ARRI FSND filters, since our filters all have the same thickness. They are precision glass and the ND is a coating, which is how we can make sure they have the same thickness. 2. When using no in-camera filter you should leave the FSND shim out. 3. When using a net you should leave the FSND shim out. 4. When using a diffusion or other filter, you must adjust the flange focal depth based on the thickness of the filter. This is based on the material; technically it should be 1/3 of the BK-7 glass thickness equivalent of your filter. In practice, going with 1/3rd of the thickness of the filter itself usually works. But be careful: if you have a number of filters, each with a different thickness, you should adjust the camera’s flange focal distance each time you change filters. Not very practical. Marc — thanks for the very helpful explanation. Can a modified Alexa XR camera have these filters? Any ALEXA (except the ALEXA Studios, they have their own, built-in motorized ND filters) can be upgraded with these filters. We have a basic upgrade kit available (FSND Filter Set (Basic), K2.72137.0) that includes all you need plus the FSND filters 0.6, 1.2, 1.8 and an optical clear (same thickness). Alternatively, we have the FSND Filter Set (Full), K2.72139.0, which has everything you need plus all the FSND filters (0.3, 0.6, 0.9, 1.2, 1.5, 1.8, 2.1 and 2.4) and the optical clear.